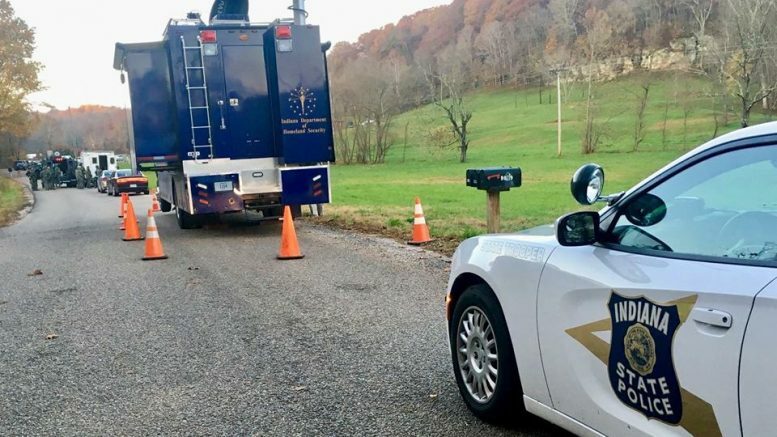 Indiana State Police say at around 6 pm Monday the Orange County Sheriff’s Department recieved a call from the owner of a home located along the 10000 block of West County Road 160 North in West Baden Springs. The owner told police she believed 34-year old Angel Pagan of French Lick could potentially be in her home. The woman had earlier reported that Pagan had threatened to kill her as the result of a domestic dispute and was afraid to return home by herself with her two-year-old child. As a result of the homeowner’s concern members of the Orange County Sheriff’s Department and West Baden Springs Police Department responded to the residence and entered the home with a key provided by the homeowner. The responding officers were also aware of an unrelated misdemeanor warrant for Resisting Law Enforcement that had been issued for Pagan’s arrest. When they entered the home the officers discovered Pagan was, in fact, in the home. The officers asked Pagan to surrender himself and say he immediately displayed a handgun and retreated into a bedroom and locked the door. The officers did not immediately confront Pagan, opting to leave the home and establish a perimeter and summon additional assistance. Within the following hour additional members of the Orange County Sheriff’s Department and members of the Indiana State Police, inclusive of SWAT team members and state police Hostage Crisis Negotiators arrived at the scene and spoke with Pagan through the evening and early morning hours trying to encourage Pagan to peacefully surrender. As Tuesday morning drew near, police say Springs Valley School officials were notified to arrange for an alternate school bus route to assure safe transportation of school age children that lived within the area. Negotiations continued through the day and into the afternoon, even as Pagan made efforts to obstruct the view into the home by placing a mattress in front of a window. Despite this, authorities offered to move to a place of personal jeopardy to speak with Pagan and implore him to surrender. When it became apparent they were not going to be successful in convincing Pagan to surrender, members of the state police SWAT team removed the door from the opposite side of the home. They say the action was taken since it was known Pagan was on the other side of the house, and if necessary to enter the home it would make entry tactically safer for law enforcement. It is believed when Pagan heard the door being removed he retreated back into the house and one gunshot was heard from within the home. Troopers then quickly entered the home where Pagan was discovered with a gunshot wound to the head. Paramedics along with a state police officer, and medical personnel from an Air Evacuation helicopter that had been summoned to the scene worked for more than 30 minutes to try and stabilize Pagan while he was in an ambulance. Pagan was pronounced deceased in the ambulance. The Orange County Coroner’s Office preliminarily ruled Pagan’s death as a self-inflicted single gunshot wound to the head. An autopsy for Pagan has been scheduled for today (Wednesday). Be the first to comment on "Wanted Suspect Dies of Self-Inflicted Gunshot Wound"